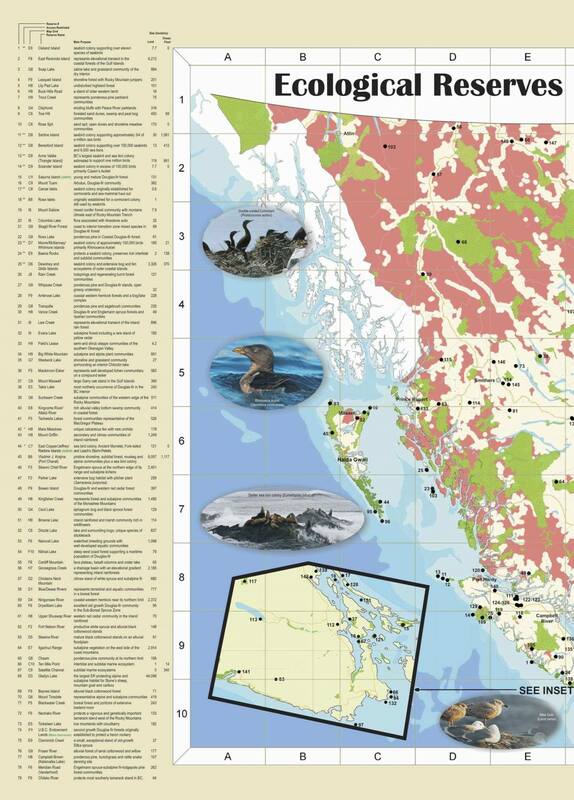 For many years, as part of their public education service, BC Parks provided a map brochure of BC’s Ecological Reserves (ERs). Since that map went out of print ten years ago there has been a gap in public knowledge and understanding of the role and importance of Ecological Reserves as part of BCs protected areas system. Happily, as part of the BC Parks Centennial Celebration (2011), BC Parks provided funds to the Friends of Ecological Reserves to up-date the information on ERs for extension purposes. The new ERs map provides a summary of the diversity of ecosystems represented and protected in ERs, as well as the challenges for managing ERs. 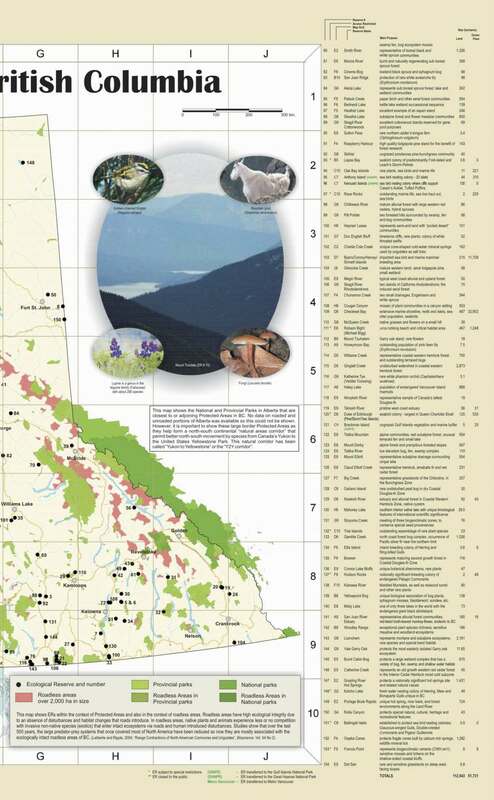 The map/ brochure also provides insights into the role the Ecological Reserves can play in understanding and sustaining BC’s biological diversity. This updated map maybe of interest to resource managers, natural research scientists, environmental educators and members of the general public who have an interest in natural resource conservation. To view the map see below. To order copies visit the Friends of Ecological Reserves website, the option to purchase will be found at http://ecoreserves.bc.ca/get-involved/buy-ecoproducts/ . As a volunteer organization Friends of Ecological Reserves needs to cover shipping costs. A single copy of a map/brochure is 4.50 plus an additional charge of 1.50 for shipping for a total of $6.00. Larger orders of ten maps will be billed at a cost of $3.00/map plus a shipping of cost of $10.00. We can accept payment by Paypal on our web site. President of Friends of Ecological Reserves. This map/brochure was made possible with a grant from the BC Parks Community Legacy Fund. Click on the images below to get a full-sized (readable) image. 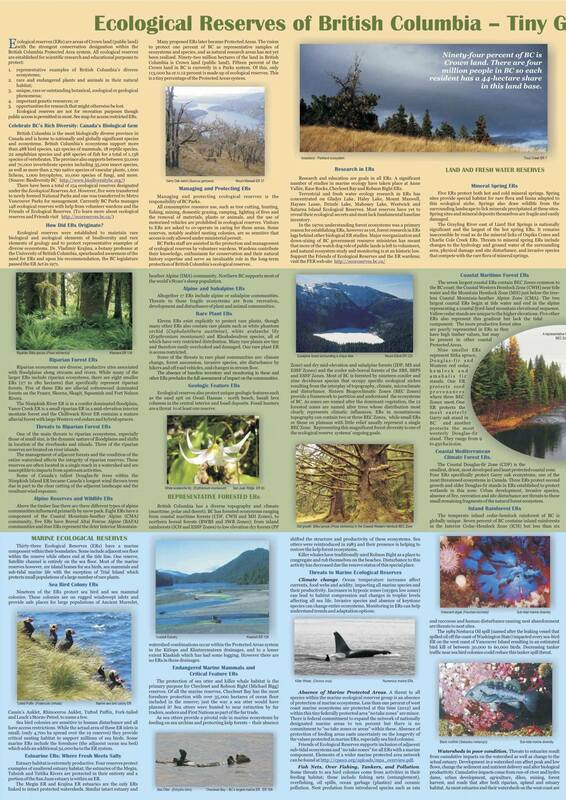 If you want some of these brochures for educational purposes, contact the Friends of Ecological Reserves. Brochure information: Since these are large files , they are split in half. Edited by Hans Roemer and Wynne Miles. Edited by Hans and Wynne. Ecological reserves are not for recreation purposes though public access is permitted See map for access restricted ERs. There were a total of 154 ecological reserves designated under the Ecological Reserves Act. Five were transferred to newly formed National Parks and one was transferred to Metro Vancouver Parks for management. Currently BC Parks protects 148 ecological reserves with help from volunteer wardens and Friends of Ecological Reserves (learn more about ecological reserves and friends visit http://ecoreserves.bc.ca/. Thirty three Ecological Reserves (ERs) have a component of marine within their boundaries. Some include adjacent sea floor within the reserve while others end at the tide line. One reserve, Satellite channel is entirely on the sea floor; however most of marine reserves are island homes for sea birds, sea mammals and sub-tidal marine life with the exception of Trial Island which protects small populations of a large number of rare plants. Nineteen of the ERs protect sea bird and sea mammal colonies. These colonies are on rugged windswept islets and provide safe places for large populations of Ancient Murrelet, Cassin’s Auklet, Rhinoceros Auklet, Tufted Puffin, Storm and Leech’s Petrel, and many more seabirds. Sea bird colonies are sensitive to human disturbance and all have access restrictions. Though the actual area in ERs associated with these islets is small, only 4700 ha spread over the 19 reserves, most of the reserves consist of numerous small islets which are critical nesting habitat to support the millions of BC’s sea birds. Some marine ERs include the foreshore (the adjacent ocean sea bed) which adds an additional 32000 ha to the ER system. Marine ecosystems are dangerous places to do field research. Anne Vallee lost her life while conducting research on sea birds on Triangle Island, an ER that now bears her name. Robin Morton lost his life while studying orcas (killer whales) at the Robson Bight (Michael Bigg) ER. Estuary habitat is extremely productive compared to surrounding areas. Four reserves protect examples of unaltered estuary habitat; the estuaries of the Megin, Tahsish and Tsitika Rivers are protected in their entirety and a portion of the San Juan estuary is within an ER. The Megin ER estuary and Krajina ER estuaries are the only ERs linked to intact protected watersheds. Similar intact estuary and watersheds combinations occur within the protected areas system in the Kitlope and Khutzeymateen drainages, and to a lesser extent Klaskish which has had some logging, however these drainages do not have any portion as ecological reserve. Endangered marine mammals and critical feature ERs. Climate change. Ocean temperature increases affects currents, food webs and acidity impacting all marine species and their productivity. Increases in hypoxic zones (oxygen low zones) can lead to habitat compression and changes in trophic levels affecting all sea life. Invasive species and absence of keystone species can change entire ecosystems. ERs and monitoring can help understand trends and adaptation options. Absence of Marine Protected Areas. A threat to all species within the marine Ecological Reserves group is an absence of protection of marine life as it is under federal not provincial control. Less than one percent of west coast marine ecosystems are protected at this time (2012) and within this tiny federally protected area “no take zones” are minor. There is federal commitment to expand the network of nationally designated marine areas to ten percent but no commitment to “no take zones or areas” within these. Absence of protection of feeding areas casts uncertainty on the longevity of the values protected in marine ERs especially sea bird colonies. Friends of Ecological Reserves supports inclusion of adjacent sub-tidal ecosystems and no take zones for all ERs with a marine component. 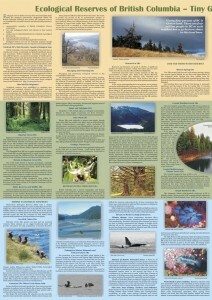 Elements of a wider marine protected area network can be found at http://cpaws.org/uploads/mpa_overview.pdf. Fish Nets, Over Fishing, Tankers, and Pollution. Threats to sea bird colonies come from activities in their feeding habitat; these include fishing nets (entanglement), overfishing, oil spills, ocean garbage (plastics) and oceanic pollution. Absence of protection of feeding areas (less than 1% of BC’s marine areas are protected) casts uncertainty on the longevity of marine sea bird colonies. Nest predation from introduced species such as rats and raccoons and human disturbance causing nest abandonment are threats to nest sites. The 1989 Nestucca Oil spill (named after the leaking vessel that spilled oil off the coast of Washington State) impacted every sea-bird ER on the west coast of Vancouver Island resulting in an estimated bird kill of between 30,000 – 60,000 birds. Decreasing tanker traffic near sea bird colonies could reduce this tanker spill threat. Threats to estuaries result from cumulative impacts on the watershed as well as change to the actual estuary. Development in a watershed can affect peak and low flows, change the sediment and nutrient delivery and alter biological productivity. Cumulative impacts come from run of river and hydro dams, urban development, agriculture, dikes, mining, forest harvest, and roads that that alter both riparian, upland and estuary habitat. As most estuaries and their watersheds on the west coast are developed, ERs can provide benchmarks to understand the function of an estuary in its natural state. Five ERs protect both hot and cold mineral springs. Springs sites provide special habitats for rare flora and fauna adapted to this ecological niche. Springs also draw wildlife from the surrounding landscape to lick minerals precipitated at these sites. Spring sites and mineral deposits themselves are fragile and easily damaged. The Grayling River east of Liard Hot Springs is nationally significant and the largest of hot spring ERs. It remains inaccessible by road and as do the mineral licks of Ospika Cones and Charlie Cole Creek ERs. Threats to mineral spring ERs include changes to the hydrology and ground water of the surrounding area, physical damage and site disturbance, and invasive species that compete with the rare spring flora. A number of ERs such as Cecil, Columbia, Dry William, Brown, Torkelsen, Alezea, Ross and Lily Pad Lake ER are named after nearby lakes even though the lakes are not included in the ER. Other ERs are named for lakes included in their boundaries though these lakes are not their main feature, for example Gladys and Haley Lake ERs respectively protect habitat for Stone’s sheep and Vancouver Island marmot. Mahoney and Soap Lake ERs protect rare and fragile saline lakes in a dry grassland environment. Other lake-named ERs protect island breeding colonies of rare Ring-billed Gulls and one supports a Herring Gull colony. Moose calve in one of these island reserves finding safety with the water birds. Two coastal lake ERs protect uniquely evolved stickleback fish populations. Four other lake ERs represent diverse aquatic ecosystems as well as portions of the surrounding plateau and one ER represents a boggy coastal lake. Numerous small lakes are protected within other ERs. Gulls form the inland bird colonies will abandon nests when disturbed. Two of the three inland bird colony ERs have access restrictions but an absence of public awareness and enforcement leaves these colonies vulnerable. Rare stickleback populations are threatened by illegal fishing, introduced species and changes in water quality and quantity from development in the surrounding catchment areas. Saline lakes are sensitive to changes in water quality and quantity due to grazing and disturbance of catchment land outside these small reserves boundaries. Illegal hunting, fishing, grazing, logging and introduced species affect indigenous flora and fauna in all the lake ERs. Grazing accelerates invasive species encroachment on all the interior ERs, thus potentially degrading them as benchmarks. Inability to consistently monitor and enforce restrictions leaves these ERs vulnerable. Seepage, standing water and organic soils are common to many ERs but for fourteen ERs these wetter, water dominated, hygric ecosystems are the protected feature. Often some better drained upland forest is included in the ER as well. Two coastal hygric ERs are adjacent to valley bottom river floodplains. Two ERs protect rare wetlands of the Coastal Douglas Fir zone and one ER near Vancouver protects the rapidly disappearing hygric ecosystems of the lower mainland. 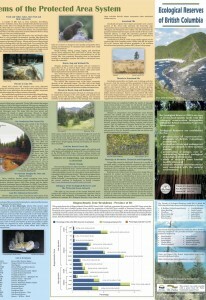 Five interior ERs represent some of the hygric community diversity of the sub boreal forests. Two ERs, east of the Rocky Mountains represent northern boreal forests wetlands and one ER represents wetlands in the mid-elevation southern montane forest. Small ERs which encompass only part of a drainage area can be impacted by changes to the water quality and quantity from grazing, tree harvest, hunting, trapping, fishing, and recreation activities in the adjacent portion of the drainage area. Similarly these activities directly impact ecosystems when unchecked within reserves. Grassland communities are fragile, easy to damage and slow to recover. Only the remote northern grasslands of Gladys Lake ER are currently inaccessible and therefore free of invasive species impacts linked to roads and livestock grazing. However this area is vulnerable to illegal hunting and trapping due to a lack of monitoring. In comparison the southern grass land ERs are tiny remnants within highly altered landscapes. Species in small isolated ERs suffer from habitat fragmenttion and the cumulative impacts of urban and agricultural development, grazing, invasive plants, and fire suppression and subsequent forest encroachment. Riparian ecosystems are diverse, productive sites associated with floodplains along streams and rivers. While many of the larger ERs have inclusions of riparian ecosystems, eight smaller ERs (27 to 180 hectares) specifically represent riparian forests. Five of these ERs are alluvial cottonwood dominated forests on the Fraser, Skeena, Skagit, Squamish and Fort Nelson Rivers. The Nimpkish River ER is in a conifer dominated floodplain. The Vance Creek ER is a small riparian ER in a mid-elevation interior montane forest. One of the main threats to riparian ecosystems, especially those of small size, is due to the dynamic nature of floodplains which can with time result in a shift in location of the riverbanks and islands. Three of the riparian reserves are located on river islands. The management of adjacent forests and the condition of the entire watershed affects the integrity of riparian reserves. These reserves are often located in a single reach in a watershed and are susceptible to impacts from upstream activities. Some of Canada’s tallest Douglas fir trees within the Nimpkish Island ER became Canada’s longest wind thrown trees due in-part to the clear cutting of the adjacent landscape and the resultant wind exposure. Above timber line there are three different types of alpine communities influenced primarily by snow pack. Eight ERs have a component of the Coastal Mountain-heather Alpine (CMA) commumity, five ERs have Boreal Altai Fescue Alpine (BAFA)communities and four ERs represent the drier Interior Mountain-heather Alpine (IMA) community. Northern BC supports most of the world’s Stone’s sheep population and Gladys Lake?the largest ER protects alpine grasslands for them. Vancouver Island Marmot are unique to Canada and habitat for them is protected in an alpine and subalpine forest ER. Six ERs represent some of the diversity of BC’s three alpine climates. Altogether 17 ERs include alpine or subalpine communities. Threats to these fragile ecosystems are from recreation, development and disturbance of plant and animal communities. Eleven ERs exist explicitly to protect rare plants, though many other ERs also contain rare plants such as white phantom orchid (Cephalanthera austinae), white avalanche lily (Erythronium montanum), and Rhododenron species, all of which have very restricted distribution. Many rare plants are tiny and therefore easily overlooked and damaged. One rare plant ER is access restricted. Some of the threats to rare plant communities are: forest succession, invasive species, site disturbance by hikers and off road vehicles, and changes in stream flow. The absence of baseline inventory and monitoring in these and other ERs precludes the full assessment of impact on the communities. Ecological reserves also protect unique geologic features such as the sand spit on Gwaii Haanas north beach, basalt lava columns in the central interior and fossil deposits. Fossil hunters are a threat at least to one reserve. BC is Canada’s most diodiversity rich province due to its’ diverse topography and climate (ranging through maritime, polar and desert). BC has forested ecosystems ranging from coastal maritime forests (CWH and MH zones), to northern boreal forests (BWBS and SWB zones), to inland rainforests (ICH and ESSF zones), low elevation dry forests (PP zone) and dry midelevation and subalpine forests (IDF, MS and ESSF zones), and to the cooler sub- boreal forests of the SBS, SBPS and ESSF zones) and cold northern boreal forests (BWBS and SWB). Most of BC is forested by nineteen conifer and nine deciduous species that occupy specific ecological niches resulting from the interplay of topography, climate, microclimate and disturbance. Eighteen biogeoclimatic zones (BGCZ) provide a framework to partition and understand the ecosystems of BC. As zones are named after the dominant vegetation, the fourteen forested zones are named after trees whose distribution most clearly represents climatic influences. ERs in mountainous topography can contain two or three BGCZ while small ERs or those on plateaus with little relief usually represent a single BGCZ. Representing this magnificent forest diversity is one of the ER system ongoing goals. The seven largest coastal ERs contain BGCZ common to the BC coast; the Coastal Western Hemlock zone (CWH) near tide water and the Mountain Hemlock zone (MH) just below the tree-less Coastal Mountain-heather Alpine zone (CMA). The two largest ERs begin at tide water and end in the alpine representing a type coastal fjord-land mountain elevational sequence. Yellow cedar stands are unique to the higher elevations. Five other ERs also represent this gradient but lack the tidal component. The more productive forest sites are poorly represented in ERs as they were logged, but may be present in other coastal Protected Areas. Nine smaller ERs represent Sitka spruce, Douglas-fir and red cedar, hemlock and amabalis fir stands. One ER protects seed provenances where three BGCZs meet. One ER protects the most easterly Garry oak stand in BC and another protects the most westerly Douglas-fir stand. They range from 9 to 450 ha in size. Coastal Mediterranean Climate Forest ERs. The Coastal Douglas Fir zone (CDF) is the smallest, driest, most developed and least protected coastal zone. Four ERs specifically protect Garry oak ecosystems, one forest type in this zone and one of the most threatened ecosystems in Canada. In addition three? ERs protect second growth and older Douglas-fir stands that are found adjacent to two wetland ERs in this zone. ( do you mean ‘Second growth and older Douglas-fir stands are protected in ERs set up to protect wetlands in this zone’? Urban development, invasive species, absence of fire, recreation and site disturbance are threats to these small remaining fragments of the natural forest ecosystem. The temperate inland cedar-hemlock rainforest of BC are globally unique. Seven percent of BC is inland rainforests in the Interior Cedar-Hemlock Zones (ICH) but less than 6% is protected. Twelve ERs have this unique rainforest with half the area in ERs in the Nass and Skeena drainages and the remainder of the area in seven smaller ERs in the Kootenay and Okanagan areas. Threats to inland rainforest ERs are from illegal logging shake cutting, wildlife poaching and trapping and the ability to enforce no take restrictions in ERs. The larger ERs also have spruce and subalpine fir stands at upper elevations. Ponderosa pine stands of the Ponderosa Pine (PP) zone occur at higher elevations above the Bunchgrass (BG) zone. These pine forests may have grassy understories unless fire suppression has allowed shrubs to dominate. Ponderosa Pine stands are rare in BC. Less than 1% of BC is in the PP zone but less than 1/10th of a percent is protected by 102 protected areas of which 10 small ERs make up 287 ha. Urban and agriculture expansion have fragmented these ecosystems and most mature stands have already been harvested. These tiny but precious remnants face threats from invasive species, fire suppression and grazing. Drier southern interior valleys transition from lower elevation forests (Interior Douglas-fir or IDF zone) to the mid elevation Montane Spruce (MS) Zone and the higher elevation Engelmann Spruce-Subalpine Fir forest (ESSF) zone. ERs include examples of stands of western larch, Douglas-fir, and three stands of lodge pole pine. Outside of ERs other protected areas may also have stands representative of these forests. Thirteen ERs capture some of the diverse forest types of the central interior plateau from paper birch, aspen, Engelmann and white spruce stands to the most northerly Douglas-fir stand, the most vigorous tamarack stand west of the Rockies, as well as early seral burned forest, high quality pine, and subalpine fir stands. These are the forests of the interior plateau and SBS, SBPS and ESSF zones. Illegal logging, hunting and trapping are threats to these small ERs. As well their small size exposes them to blowdown when adjacent areas are logged, and an absence of replication (more than a single example) can be a threat to long term survival. Five ERs protect Engelmann spruce, aspen, early and late seral white spruce and subalpine fir stands of the most northerly forests(BWBS & SWB zones). Firewood cutting, wildlife disturbance ( what is this), hunting and trapping are all threats to the values in these northern forest reserves. Threats to Terrestrial and Freshwater Ecosystems. Adequacy of Protected Areas and the ERs Network. The current protected areas in BC may not be sufficient to maintain BC’s biodiversity. Changes in temperature and precipitation most directly influence the wettest and driest ecosystems, the so called edaphically (soil) controlled sites, where climate change impacts may first be noted. Wetland ERs that do not include the entire drainage are at risk from change outside the ER’s boundary from forestry and grazing as well as illegal hunting, fishing, trapping, grazing and invasive non-native species. Lack of replication is another threat to the values in current ERs. The broader purpose of ERs is to protect BC’s biodiversity by preserving representative areas, thus allowing for scientific research to guide future management of ecosystems both in and outside protected areas???? . Shortage of inventory, research and reporting. Unique ERs cannot be duplicated. However it is possible to represent widely occurring extensive ecosystem types (such as larch, birch, Douglas-fir and cedar stands)in more than a single benchmark ER to facilitate the study and comparison of their adaptation to future changing conditions.. Replication also helps protect diversity when single ERs are impacted by natural and human disturbances such as fire suppression and insects. It is unclear whether current protected areas provide an adequate network of connected habitats for species to migrate as a response to climate change. Further information is also needed to determine if practices outside of protected areas allow for this movement of species. Many species may be isolated and eventually lost, if changes are not made to address the connectivity issue. Cumulative Impacts to biological diversity. Over the last 500 years cumulative losses of major indigenous species has been documented across North America. 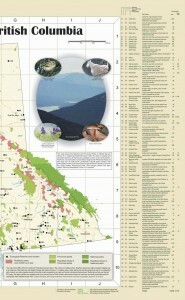 Shrinking large mammal and carnivore ranges mean that the roadless area shown on the ER map of BC provides the best remaining opportunities in North America to keep this megafauna diversity but only if there is adequate protection and research as well as limits on development in these remaining areas. Ecological reserves were established for the maintenance of biological diversity. Dr. Vladimir Krajina, a botany professor at the University of British Columbia, spearheaded awareness of ERs and upon his recommendation the BC legislature passed the ER Act in 1971. The early ER program also helped create new Parks but the vision to protect 1% of BC as an insurance policy for sustainable development has not yet been realized. BC crown land (public land) is 92 million hectares and the current ERs are 114,000 ha or a 1/1000th of a percent of the crownlands. The orginal ER system goal was to set aside 1% of BC as ERs. Parks in BC are currently 15% of crown lands and the ERs are a 1/10th of a percent of the Parks System a very small insurance policy. At risk is beautiful diverse BC. The management and protection of ecological reserves is the responsibility of BC Parks. All consumptive resource uses, such as tree cutting, hunting, fishing, mining, domestic grazing, camping, lighting of fires and removing materials, plants or animals, and the use of motorized vehicles are prohibited in ecological reserves. Visitors to ecological reserves are asked to co-operate in caring for these areas and some reserves, notably seabird nesting colonies, are so sensitive that access is only allowed under ministerial permit. BC Parks staff are assisted in the protection and management of ecological reserves by volunteer wardens. Wardens contribute their knowledge, enthusiasm for conservation and their natural history expertise to the protection of specific ecological reserves. The wardens serve an invaluable role in the long-term protection of British Columbia’s ecological reserves. Note: Ecological reserve numbers marked with * are closed to the public due to the sensitive nature of these areas. The closure at Robson Bight (Michael Bigg) Ecological Reserve covers the land component of the reserve only. Trial Islands, S of Oak Bay The most outstanding assemblage of rare and endangered plant species in B.C. ** Approximately 47,647 hectares of this total area covers marine waters.